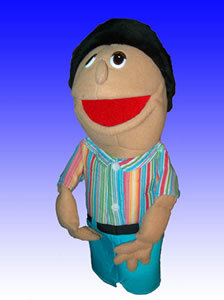 Large Brother with black hair.Â This puppet is one of the "Family & Friends " line of puppets. They are designed for use by children, beginning puppeteers or in classroom settings. This line of puppets is 16 inches tall with soft, pliable mouths large enough for adult hands. Made of sponge-backed velour tricot fabric, they have foam-filled heads, arms and hands. Friendly Neighbor puppets are flame retardant, meet U.S. child safety standards, and are hand washable. Comes with 2 acrylic rod that velcro to wrist.